Kiddush cups are used for an important and dignified ritual, and as such should comply with the nature of the occasion. 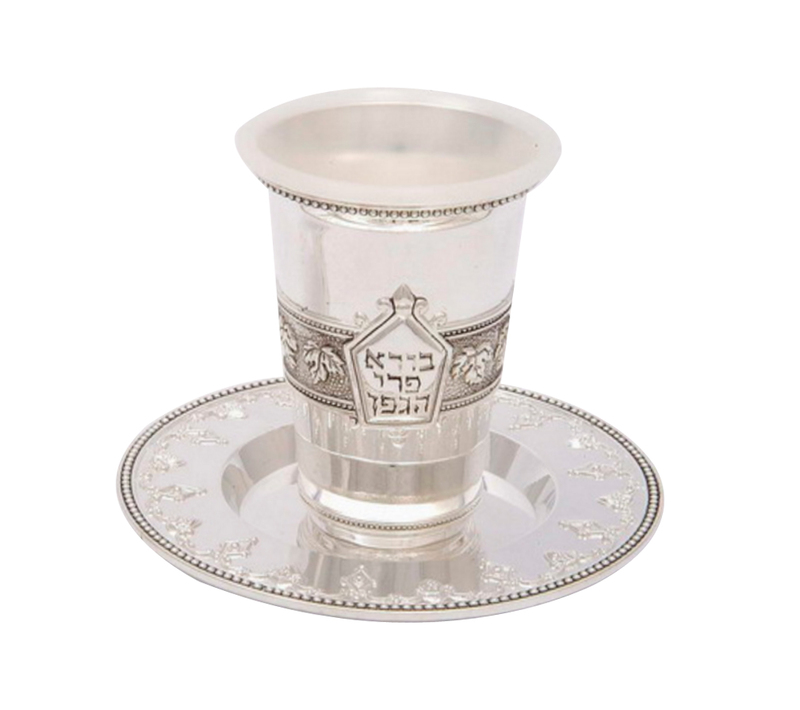 This elegant and nicely decorated silver plated Kiddush cup will perfectly suit the blessing over your Shabbat and holiday table. This sterling silver Kiddush cup is a perfect example of harmony between traditional decoration and practical workmanship. The cup is made of metal, it is silver plated and decorated with grape leaves and filigree style ornaments. The central part of the cup carries pentagonal form with the part of the blessing over wine, written in Hebrew – “borei pri hagafen“. The cup is complemented by elegant silver saucer, decorated in the same style. Practical part of the cup is insert, which can be removed for washing. This nice and elegant Kiddush cup will be perfect part of your table for Shabbat and Jewish holidays. Make the blessing before meals and recitation of the Kiddush special moment, with the help of this finely crafted Judaica Kiddush cup.